Take out the crockpot because it's that time again.......homemade stew, chili and soup. Say so long to those hot summer days and say hello to the comfort foods of fall and winter. 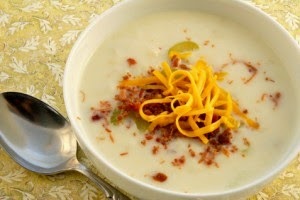 Kudos to my niece Christine for sharing this crockpot Cheesy Potato Soup recipe. Start this dish before you leave for work in the morning. Takes just a few minutes to prepare. Serve with some crusty bread and a grilled chicken or shrimp side salad and you're good to go. It doesn't get better than this. Enjoy. Put the potatoes in the crockpot. Add in the chicken broth, cream of chicken soup and half of the bacon bits. Add a pinch of salt and pepper. Cook on low for 7-8 hours or until potatoes are tender. An hour before serving, cut the cream cheese into small cubes. Place the cubes in the crock pot. Mix a few times throughout the hour before serving. Once the cream cheese is completely mixed in, it's ready to serve. Top with cheddar cheese and some additional bacon bits. Can’t even find the dirt! Need More Tech Support at Your Nonprofit Org? Try Looking Within. All rights reserved © 2010 Evamarie Moran. Picture Window theme. Theme images by 4x6. Powered by Blogger.